He is Unto, the baby of the Riikonen family. He is a rubber doll which I have bought from Minimaailma. He looks a bit like the German Bully Babies, but I am not sure if he is one. 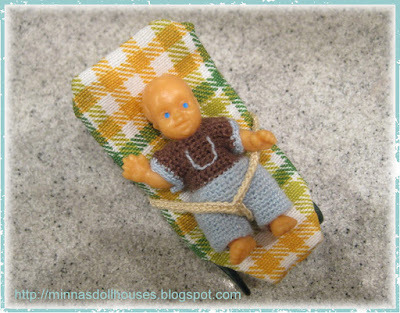 I just crocheted him a new outfit and he is sitting in his babysitter which I made a long time ago. Tämä on Unto, Riikosen perheen vauva. Hän on kuminen nukke jonka olen ostanut Minimaailmasta. Hän näyttää vähän saksalaiselta Bully Babies -nukelta, mutta en tiedä onko hän sellainen. Olen juuri virkannut hänelle uuden puvun ja hän istuu sitterissään, jonka olen tehnyt aikoja sitten. Wonderful Minna- I am amazed at your tiny little stitches! I cannot imagine how you work clothes so tiny! Did you make is clothes? Did you make his clothes? Minna the baby with his clothes is so cute!!! !